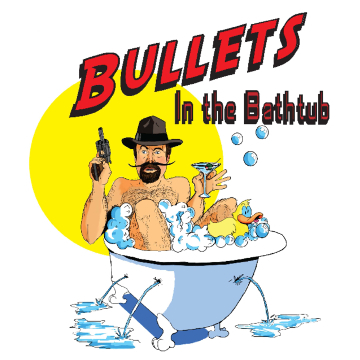 Bullets in the Bathtub | Jest Murder Mystery Co. Welcome to the 1920’s where bathtubs were made for one thing only. To make gin! (Ok, maybe two things). Lot’s of gangsters are showing up at “Cherry’s Speakeasy” to talk about the turf war going on between the Corneolis and the Buttafuccos. Just when we think things are going to settle down, in comes Harry Hyde, (the famous Russian mobster). He sure does know how to make enemies! Deadly ones! I guess the local constable, Doyle Lonnegan, will come and solve the crime, but not before things get pretty wild! You’ll meet crazy characters like Red E. Mix, (the local concrete salesman), Trixie, ( the owner of Cherry’s) and many others before we find out who put “da finger” on Harry’s Hyde! Was it Larry, The Rug? Was it Joey, The Lips? Or maybe, J Edna Hoover? When you come to “Bullets in the Bathtub”. don’t forget to bring your gangster hat, tommy gun and flapper!